"They call us lost boys, because they found us without parents." "But which situation is better? Before, or now, here?" Human suffering comes in all shapes and sizes, and goes on around the world on a pathetically regular basis. That's hardly uncommon news, and when we hear reported stories about distant countries where bloody civil wars decimate populations it is sometimes difficult to really, fully comprehend. The death tolls are always staggering, and for me it always seems like we only hear about things in this country after they happen, and I catch myself wondering how so many people could have died in a war I knew nothing about. Case in point with Sudan, where in the late 1980s and early 1990s, a powerful Islamic fundamentalist movement waged its own form of mass murder/housecleaning by taking steps to wipe out the so-called Christian separatists. This apparently lopsided battle left a mountain of dead in its wake, and it also left behind nearly 20,000 male orphans, who were the children of the men killed when the Islamic fundamentalist forces swept through their farming villages. 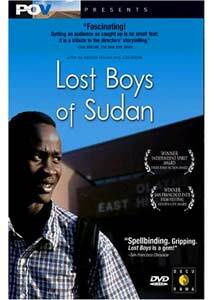 It is these so-called "lost boys"—the orphaned southern Sudanese children of the Dinka tribe—that form the subject of this documentary from filmmakers Megan Mylan and Jon Shenk, and in addition to a brief festival run, has been presented as part of Public Television's POV series. As we learn in a powerful voice-over during the film's opening, the children were left to fend for themselves in the wilds of Sudan in order to survive, fending off such incomprehensible hardships as lion attacks, before eventually finding their way to a series of refugee camps established in Kenya. Some of the teenaged boys were selected to take part in a US government-sponsored resettlement program, where a number of them were given the opportunity to leave their homeland and move to the United States (to places like Texas, California, North Dakota, or Kansas), an unknown, magical and completely alien place that many of the Sudanese referred to as "heaven on Earth". With the boys' own dream-like high hopes and the memories of their friends left behind, Lost Boys of Sudan follows an often heartbreaking look at the unexpectedly harsh realities that awaited them upon their arrival. Mylan and Shenk focus largely on a year-and-a-half in the life of a pair of "lost boys", the charismatic and affable Santino Majok Chuor and the serious and driven Peter Nyarol Dut, who initially were relocated to Houston, Texas. Despite the promises of education assistance and help to start over, the film is openly frank in its presentation of the way the boys were seemingly plopped in a strange land and left to make it on their own. The agencies and organizations behind the programs, who did pay the boys' rent/expenses for the first four months, do not come across as overly helpful or involved at all—witness the rushed instructions on how to use an electric range, issued to a group of teens who come from a land without electricity—and as Mylan and Shenk catch the conversations of Santino, Peter, and the other "lost boys" it becomes evident that the reality is not living up to the promises. While Mylan and Shenk do offer an indirect look at the inadequacies of the immigration system and its assorted agencies, and specifically the resettlement programs, the individual stories of Santino and Peter that bring a very human face to things. Aside from highlighting the typical problems of the entire resettlement program as part of the new immigration, it is the boys' loneliness, sadness, and stress that resonates with what Mylan refers to in the commentary as the unending "treadmill of modernity" that they found themselves immersed in. The cultural disconnection between Sudan and the United States is so staggeringly huge that watching Santino and Peter try and make their way and perform the tasks we take for granted, from passing a driver license exam, getting a money order, or making new friends, is an immensely powerful and emotional experience. Image Transfer Review: Lost Boys of Sudan is presented in 1.85:1 anamorphic widescreen. This is a pretty decent transfer, devoid of nicks and blemishes, and offers up images that reveal a subtle vibrancy and detail, with solid black levels. The imperfections of recording in a variety of locations are evident, but the transfer doesn't falter under the lighting constraints of the varied conditions. Audio Transfer Review: Audio is offered in 2.0 stereo. and the mix falls into that "documentary" mode, where it doesn't have to be particularly aggressive to be effective. With no formal narration, a film like this relies almost entirely on the voices and conversations recorded by the filmmakers on location, and the presentation is above average, clean and audible. Extras Review: Megan Mylan and Jon Shenk provide a strong commentary track here, and unlike a lot of documentary commentaries, this one doesn't just discuss the mechanics of filmmaking, but rather offers more insight, narrative, and background info on the "lost boys" themselves. The filmmakers stress their committment to "not meddling", and during scenes like Peter's high school basketball tryouts, give an honest, almost parental, spin to things as they struggled to keep their impartial distance. It's a nice bit of honesty from Mylan and Shenk, and the entire track is a solid addendum to an inspiring and moving film. A pair of two nonanamorphic deleted scenes are also included, totaling a little over six minutes. Mormons (04m:38s) has Peter trying to make heads or tails out of a new religion, and Phone Company (02m:25s) has Santino and his roommates wading through a telphone company automated phone menu in order to resolve some high bills, and of the two deleted scenes this one is another snapshot of the marked cultural diversity between Sudan and the United States. The Filmmaker Interview (12m:53s) gives Mylan and Shenk the opporuntity to discuss the origins of the project and some of the ongoing difficulties, and if you don't have time to listen to the commentary, this will give you a quick overview. Where Are They Now? provides a couple of text screens with followups on Peter and Santino, and the Lost Boys Music section contains sound bites of traditional Dinka folk music and more contemporaray Sudanese jazz reggae. There are also links and information about donating to the Lost Boys program, as well as text bios on Mylan and Shenk. The disc is cut into 12 chapters. There are no subtitle options, but the film itself has hard-coded subs that are used when necessary. Lost Boys of Sudan is yet another outstanding Docurama title, this time from filmmakers Megan Mylan and Jon Shenk. The story of the young Sudanese refugees brought to the United States for a chance to start a new life is a case of "be careful what you wish for", but it illustrates the abilities of human beings to work and survive, even in an alien environment that many thought would be a "heaven on Earth". This is a remarkable film, and one that should make you look at people on the street a little differently.